Danika’s favorite thing to do lately is color! She loves it and devotes much of her day to it. 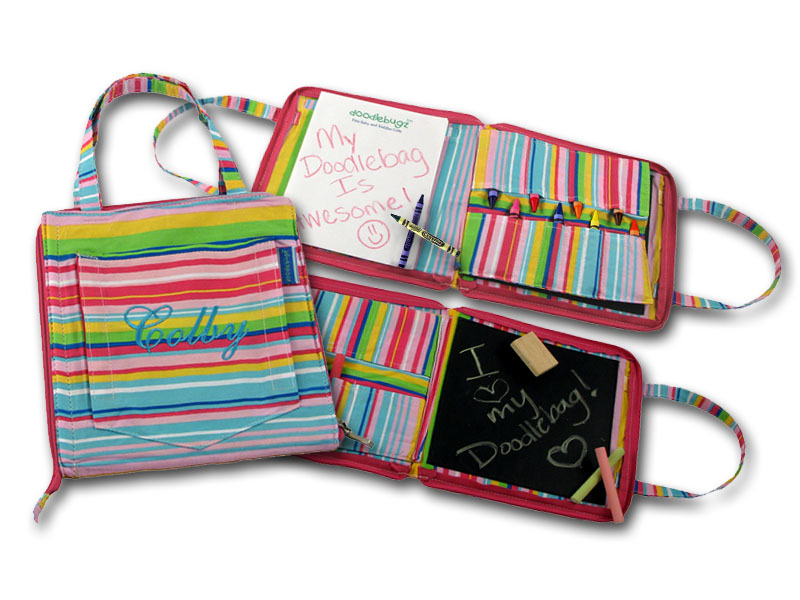 The Crayola Doodlebag from Princess Linens makes coloring at home or on the go easy and fun. You can take all of your crayons, paper, chalk and eraser with you and keep them all zipped up when you aren’t using them. 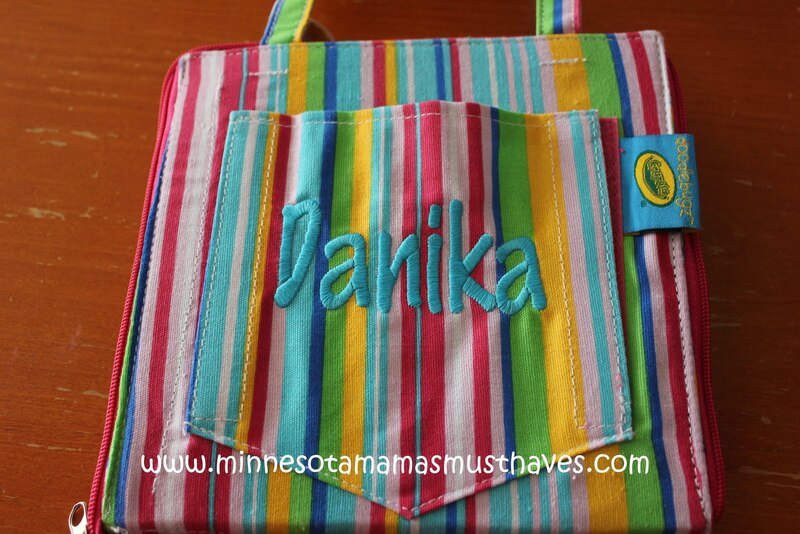 Danika received the pink striped doodlebag complete with her name embroidered on the front. How cute is that?! She was so excited about the chalkboard. 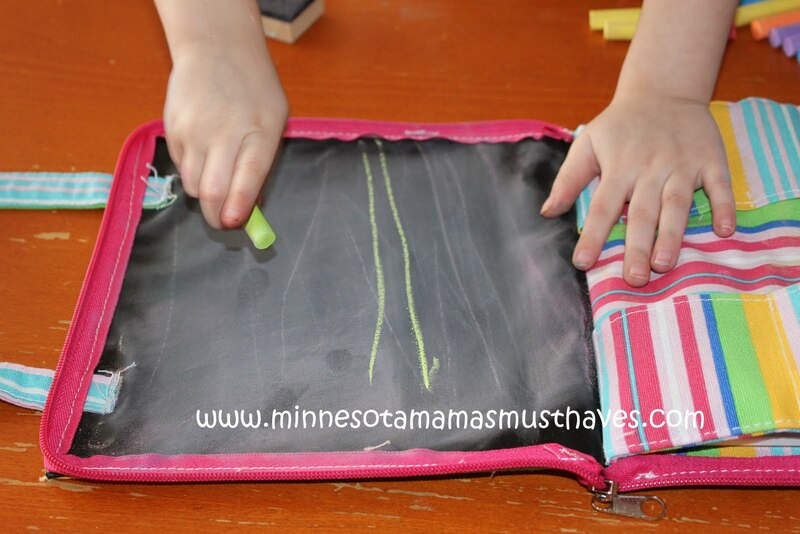 How often can your kids take a chalkboard on the go with them? She loved it! I love that it holds all the chalk in little pockets so it stays organized and isn’t rolling all over the place in the car. The doodlebag comes complete with 12 pieces of Crayola chalk and a mini eraser. You can flip the fabric over to reveal the crayons and paper too. It comes with a pad of paper and 24 Crayola crayons. Danika had this for one day and used every single piece of paper. I don’t think she put it down all day! Each crayon fits nicely into the fabric pouches. Why we love it: The Princess Linens Doodlebag is perfect for using at home or on the go. 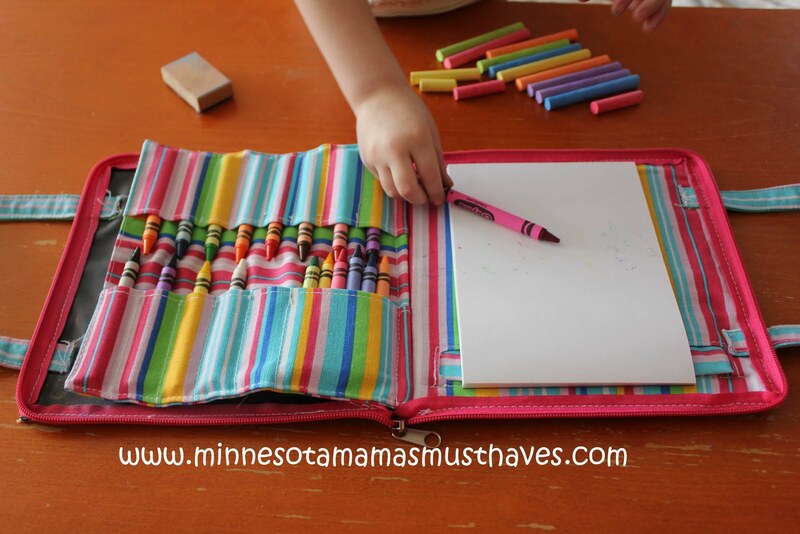 It keeps all of your kids crayons and chalk organized and zips up to keep them all in place. I absolutely love that it is personalized and the pink stripe design is adorable. These are perfect gifts for boys and girls (they come in boy colors as well). They not only make perfect Birthday gifts but would also be a great Easter basket addition! Suggestions for improvement: None, we really love the Doodlebag. Now I just need to buy some more paper! Buy It! 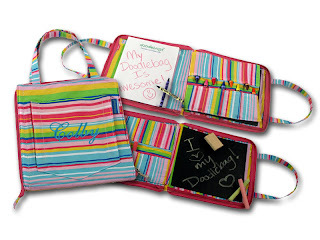 You can buy the Crayola Doodlebag on Princess Linens site for just $25.50! They come in a variety of colors too! Win! 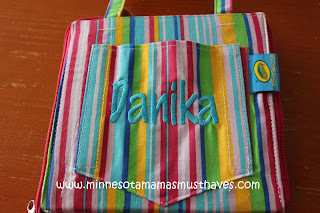 One reader will win the personalized pink stripe doodlebag for girls or the red/blue doodlebag for boys! Visit Princess Linens and tell me another product you’d like to own. If you blogged about the Birthday Bash event before the event and left me a comment on that post then take your 5 extra entries! If you grabbed the Birthday Bash button before the event and left me a comment on that post then take your 5 extra entries! Open to US only. Giveaway ends May 4th at 11:59pm. Winner will be drawn by random.org and announced on this blog as well as emailed. Products reviewed were provided to me free of charge. No compensation was given in exchange for this review. My opinion is my own and is an honest view of my experience with the product. Winner will have 48 hours to respond or a new winner will be drawn. Email address must be in at least one comment or visible on your profile to win. Good Luck! Princess Linens Crayon Keeper Review! « Birthday Bash! Aeromax Jr. Princess Dress Up! I love the pique dress with initial sash! I like the Pique Dress-Light Pink Sash-New! 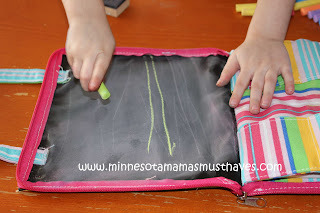 I'd also like to own a "Chalk Talk"
I Like Minnesota Mama's Must Haves on Facebook. Oh, my gosh! My toddler has been helping me in the kitchen more and more lately. I'd love to get him the Blue Chef Apron and Hat!!! I would like the Blue Lunch Tote. I would love the Red and Blue Crayon Toolbelt for my grandson. I entered the Wilton giveaway. I entered the Fellowes Paper Shredder giveaway. The Pink Stripe Crayon Apron is adorable !! I'd like to have the Pink Striped Apron. 5. What To Expect Gift Basket. I'd love to get a Personalized Denim Messenger Bag for my oldest! I also like the Navy Shortall. I like the hot pink lunch tote. I love the solid pink crayon apron! I like princess linens on FB! Entered Play-Doh Flip 'N Serve Breakfast Set giveaway. Entered $75 Gift Basket & What To Expect The Second Year giveaway. Love the Pique Pants – Green/Hot Pink. So cute! I like the Denim Chef Apron & Hat. Thanks. I like the Camo Messenger Bag. I'm an email subscriber of MMMH. I like the hot pink tote and back pack. These are so unique. I also entered the 50.oo GC to pro flowers. put the giveaway on fb profile page-autumn price. I also love the Pink Crayon apron! I entered the Zutano clothing giveaway! I like the Red and Blue Crayon Toolbelt. I love the Denim Messenger Bag. The crayon toolbelt is adorable! I entered your Gummy Lump Puzzle Case giveaway. I entered your Little Tikes Garden Cart giveaway. I entered your Puzzle Pod giveaway. Also love the chalk placemats! I entered the Lalaloopsy Giveaway. I entered the Scott Naturals Paper Products Prize Pack giveaway. I entered the Rebecca St. James new CD “I will praise you” giveaway. I entered the Burger King giveaway.